Image: The Weekender by Lowe's. 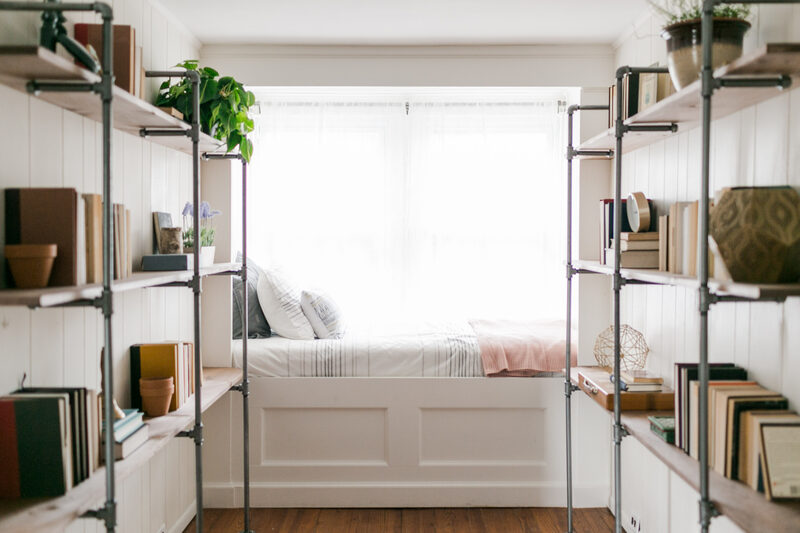 If you’re tired of endlessly pinning DIY ideas only to let them collect dust on your home improvement board, you should watch The Weekender — Lowe’s original digital DIY series that shows people how to transform spaces in a weekend. DIY queen Monica Mangin’s real-life makeover series will give you the confidence you need to finally tackle a few projects of your own. As you begin your journey toward DIY mastery, you’re sure to pick up a few new-to-you pointers while watching The Weekender. Case in point? The following super-clever (not to mention crafty) home improvement tips we’ve already learned from Season 3. Despite the fact that husband-and-wife team Rob Czar and Corinne Leigh have created an entire career out of DIY’ing everything under the sun on their YouTube channel, Threadbanger, even Rob was hesitant to use a chop saw in Episode 1. Yes, power tools are intimidating — but as it becomes readily apparent from the moment Rob learns to wield that chop saw, they are a useful resource for the home DIY’er. Mastering a few of Mangin’s favorite power tools could help you reach weekend warrior status sooner rather than later. It can be tricky to find a good compromise between bright white paint that opens up a room and the intense color so many of us crave. Threadbanger‘s Rob and Corinne wanted a trendy minimalist aesthetic in the master bedroom of their new home while incorporating an interesting hue or two. Mangin came up with a clever solution by using white for the majority of the bedroom walls but by painting a rectangle of jewel-tone green on one wall as an accent-slash-art-feature. Take it from someone who has made this messy mistake before — just “winging it” when it comes to painting trim or alternating paint colors in a space is a bad idea. And in Episode 1, Mangin reveals there’s a new painter’s tape in town: 3M Platinum Painters Tape. Unlike typical paper-y painters tapes, this “plastic-y” version (in Mangin’s words) tears cleanly every time and prevents unsightly bleeding. File this under insanely clever things we never would have thought of otherwise. By cutting privacy window films and colored camera “films” to size, Mangin creates a cool faux stained-glass feature in the panes of a closet door. Yes, please! If your mail is threatening to take over your house and hold you hostage, look no further than a few closet organizers. You can repurpose everything from hanging shoe holders to clothing separators by turning them into smart, clutter-free office storage. Need deets? See Episode 2. It can be daunting when you purchase a home that has circa ’70s wood paneling. Can you even paint that stuff? Mangin proves that you not only can, but also that doing so can make a dramatic difference in your space. The key is completing the bulk of the painting with a roller and then going back over the grooves with a brush. Let’s be real. Desks can be exorbitantly expensive. And the ones that aren’t, well, you’re lucky if they can support the weight of your laptop without buckling. So what’s a person in need of a desk to do? Think like Mangin and grab a wooden sawhorse. Pop that sucker underneath a wood slab for a top, and — voila! — you’ve got a sturdy desk. This may be the most genius thing we’ve ever seen. While creating a guest room typically inhabited by cats, Mangin builds a headboard frame to hold three artful doormats. The playful print of the doormats keeps the headboard aesthetically appealing, while the texture gives kitties an ideal spot to extend their claws. The whole setup is so gosh-darn cute, guests would never suspect the headboard was crafted as a casual cat-scratching zone. Seriously, if you have cats, you’d be remiss not to watch Episode 4. In addition to underscoring the point that you can never make too many cat puns, Mangin takes a thrifted suitcase and turns it into cat “bunks.” Bonus? She also transforms an old steamer trunk into an incognito litter box. 10. It’s OK to make mistakes! Don’t let fear of messing up keep you from tackling home projects. As Mangin so wonderfully puts it, “In DIY, it kind of comes with the territory. You try, fail, learn from your failures and then succeed… hopefully.” After all, part of the fun of DIY’ing is building up your home blooper reel.